The site of the planned hotel/casino. 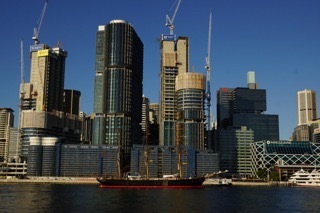 (centre of photograph) looking south from the new Barangaroo headland park. Its supporters have described it as iconic - even a masterpiece. The planned Crown Sydney Hotel Resort at Barangaroo South will certainly stand out: consisting of three key elements, podium, hotel and tower, forming three distinct "petals" that twist and rise, tapering off at different points, it will be one of the tallest structures in the city. According to its designers, the highly regarded British architectural firm of Wilkinson Eyre, the tower will have a silvery glass cladding with different levels of transparency, and rise to a height of 271 metres, or 889 feet. 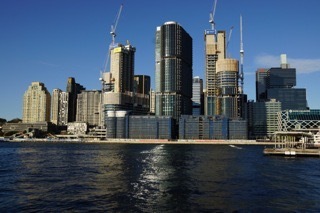 But not everyone is convinced that the planned hotel/casino complex at Barangaroo will be another jewel in the Harbour City's sparkling crown. Some, who like the sleekness and elegance of the design itself, believe the building as currently planned would be too big, too tall, and in the wrong place, occupying what was to have been the only waterfront public recreation space on Barangaroo South, causing significant overshadowing and wind tunnel effects, and with 500 car parking spaces, creating additional traffic congestion. Others believe the planned complex would be of little public benefit, and should not be built at all. In this contrarian perspective, Philip Drew gives his reasons why he is not a fan. Barangaroo Point: phoney headland, not the least natural looking - naive Picturesque that does not come off and provides little usable outdoor park as a consequence. If a developer is faced with the challenge of gaining acceptance for a tower on a critical location, one strategy that may be adopted is to proclaim it as a city landmark building. By definition, a landmark is an object that does not conform to the overall pattern of the city, which by its unique nature is exceptional, and hence, non-conforming with respect to the civic rules governing the majority of buildings. This is how the Sydney Opera House came to be seen as something special and unique to Sydney which is universally recognised. This is the precise tactic used to push through the hotel/casino at Barangaroo, part of a precinct development initially touted to cost $6 billion, which looks more likely to cost twice that, given the increase in Gross Floor Area from 300,000 square metres originally, to the current 605,911 square metres, effectively doubling the GFA in the ten years since the East Darling Harbour Urban Design Competition was launched by then Labor NSW Premier, Mr. Bob Carr, on May 23, 2005. The dark southern sides of the office towers, each overshadowed by its northern neighbour. In summer, reflected heat from opposite glass curtain walls will unduly illuminate the interiors to the annoyance of office workers. One is struck by the contrast it presents when compared to The Shard in London, a city that, until quite recently, resisted Manhattanisation with its ongoing consequences of shoe horning ever increasing numbers of towers into the same unchanged pattern of streets in a confined CBD development curtilage. The Shard is a 95 storey and 309.6 metres (1,016 feet) high tower. The upper viewing gallery is located on level 72, which at 244 metres is the highest habitable floor. Above it, the tapered spire rises a further 35.6 metres, making The Shard the highest tower in Western Europe. Unoccupied, the role of the spire is wholly symbolic. The name ‘Shard’ is derived from the building’s tapered shape of glass facets that resemble jagged shards of glass. The tapered shape of The Shard suggests an inverted icicle. It also references the traditional church spire pointing upwards towards heaven. One of the benefits of this spire shape, and in no small part its cleverness in a heritage conscious city such as London, is the progressive diminution of the tower profile as it rises, making it far less visible and dominant on the skyline, and hence, much less objectionable. It is located in Southwark, well away from London’s most prominent historical landmark, St Paul’s Cathedral, south of and some distance from the Thames embankment. This points to a degree of civic awareness on the part of its architect, Renzo Piano, that is entirely absent from the Barangaroo hotel project. One of the most interesting and telling aspects of The Shard is the balance between private and public it strikes in comparison with Crown Entertainment’s tower at Barangaroo in Sydney. The highest levels 68 to 72 are open to the public as viewing platforms. Below, on levels 58-65, are Shard’s exclusive residences; under them, on levels 34-52 is located the Shangri-La Hotel, and hence, is limited to paying guests. Levels 31-33 are dedicated to bars and restaurants which the public can access, below which are 26 floors of offices on levels 4-28, with the lobby occupying levels 2 to 3, above London Bridge Station on levels 0-2. Clearly The Shard is a profit making investment for its developer, Irvine Sellar of Sellar Property Group, backed by the Qatar National Bank and owned by the State of Qatar (95%). There is nonetheless a positive recognition the public should have access, by provision of the viewing galleries on the very highest floors. The bars and restaurants are among the most glamorous and spectacular in the capital. Nothing betrays the private motivation behind James Packer’s Crown tower than its comprehensive exclusion of the public from all except the very lowest podium level. The Barangaroo hotel/casino is comparable to The Shard in a number of respects: for one thing it is 271 meters tall (889 feet) on 69 floors, making it only 38.6 metres shorter. The Shard's Gross Floor Area is 110,000 square metres, compared to the Crown Hotel which, at last count, stood at 77,500 square metres. Previously, it was 230 metres high when first presented in February 24, 2010, on a pier stretching 150 metres into Darling Harbour with a GFA of just 50,000 sq. metres. This is the most amazing thing about Barangaroo—everything just gets bigger and higher as modification plan after modification plan—the number has now reached 8—facilitate what is a now a recognised phenomenon of “mission creep”. The same observation applies to the Hotel/casino whose updated budget has risen to an estimated $2 billion. Unlike the Shard, Packer’s tower is exclusively private in character. Public access is restricted to the podium retail and restaurants on levels 1 and 2. If that was insufficient, the public harbour promenade has been eroded and further compromised by allowing restaurants to extend into it leaving only 16 metres free, in defiance of the minumum 30 metre wide promenade of unencumbered walkway promised at the start. It is important at this juncture to ask, what exactly is the public benefit to the tax-payers of New South Wales of Barangaroo in hard cash? Is it just a further repetition of the treatment meted out to the original occupants of East Darling Harbour now revisited on the current native population of Sydney? At least no individual would appear to benefit, if the gambling rules excluding locals from having access are properly enforced. So what is the actual benefit, as opposed to the supposed benefits of this arrangement between government and private enterprise? Is it just a another example of a long, well entrenched trend whereby politicians facilitate the transfer of valuable public assets for, at best, a minimal return? Since the main buyers and users of this fabulous glass tower are likely to be rich Chinese gamblers and investors in property, not Australians, I am reminded of the Forbidden City, in Beijing. Our "Forbidden Tower" at Barangaroo consists of a vertical hierarchy of stratified sacred compounds, gated communities in the sky, zones of exclusion which culminate in the fabulous $100 million, three-storey ‘Sky Villa’ on levels 69-72. China’s imperial Forbidden City complex in Beijing consists of a series of rectangular walled enclosures and assembled elements of different sizes held together in perfect harmony by a south-north ‘spine’ that stretches across the city as far as the eye can see that serves as a processional way. In lieu of a horizontal processional way, there is a vertical one which offers the same bewilderment and disquiet in which reality is softened into a dream which never seems to reach its climax as we press upward into a rarefied world of emptiness and deadening silence at the top. Packer’s imperial tower is the vertical equivalent of the Forbidden City. Its spine points heavenwards: as it rises, it distances itself from the realm of ordinary humanity and ascends into the sanctified realm of the high-roller: a realm where the elite is licensed to partake of and savour the most heavenly delights - the commanding sights of Sydney and its harbour, whilst embalmed in luxury. It seems only proper and correct that ordinary Australians should be excluded - only a benighted peasant would sell his birthright in this day and age. Again and again the Packer publicity machine reminds us of the huge financial benefits that accrue from this marvellous project: jobs for 3,300 building workers, a net economic benefit of $638 million, and at least $1 billion in gaming taxes over, wait for it, the first 15 years. Break this down, it comes to just $66 million a year. That this hotel-casino should be compared with the Sydney Opera House is the final insult. One is incensed, not simply by such a comparison, but by the hubris and the disregard of the most basic tenets—and abject insensitivity--of preserving the heritage of the Harbour itself. No height limit has been imposed, nor any sensible civic design criteria applied which would limit the height of developments around the harbour foreshore. The hotel tower is 4.1 times the height of the Opera House at 67 m, 1.87 x the Sydney Harbour Bridge at 134m, and just 1.25 kilometres from the Opera House. The hotel will dwarf the sole recognised great building and truly iconic structure Sydney possesses. What does that matter, I hear you say, when everything is for sale? Think of all the employment that will be the result, not forgetting the mountain of tax from the gambling that is promised. Limits must be set if one is to go on pretending we live in a civilised community actuated by genuine values. This extends well past what is acceptable even under a Liberal National Party government led by the likes of a former broker such as Mike Baird. This is it, the ultimate test of NSW as a civil society, whether it is prepared to allow the vulgarisation of its one great natural asset, Sydney Harbour, in the cause of profit! Such a descent into barbarism under the self-serving banner of privatisation and government/private partnerships should be unthinkable. It amounts, no less, to the abject sacrifice of the public interest to enrich an already wealthy and privileged elite—as though they, the rich, desperately need more and the people warrant less. That is the way the wealthy have always viewed the world and continue to do so. The Shard in London vividly demonstrates just how impoverished, thoughtless and selfish the Packer hotel project at Barangaroo truly is, how much it grabs for itself, and how little it gives back. If ever there was a red-toothed symbol of outrageous unprincipled capitalism on the rampage, it is this tower devoted to servicing gambling and vulnerable to exploitation by money launderers, which will dominate the Sydney skyline and darken the sparkling waters of Sydney Harbour with its shadow for generations to come.